Vezi Acum Miraculous: Tales of Ladybug & Cat Noir S01E20 - Pixelator Online Subtitrat in romana calitate HD. Miraculous: Tales of Ladybug & Cat Noir S01E20 - Pixelator este un episod lansat pe 28 februarie 2016 super! Vezi acum online gratuit! Marinette's class is visiting the Grand Paris hotel, as part of a program to try out some of the jobs that the staff do in the hotel on a daily basis, when rock idol Jagged Stone arrives. While Jagged is checking in, an overly-obsessed fan named Vincent Asa sneaks in behind him and tries to take a picture with Stone, but he is swiftly kicked out of the hotel by Jagged's assistant, warned to never approach Stone again. 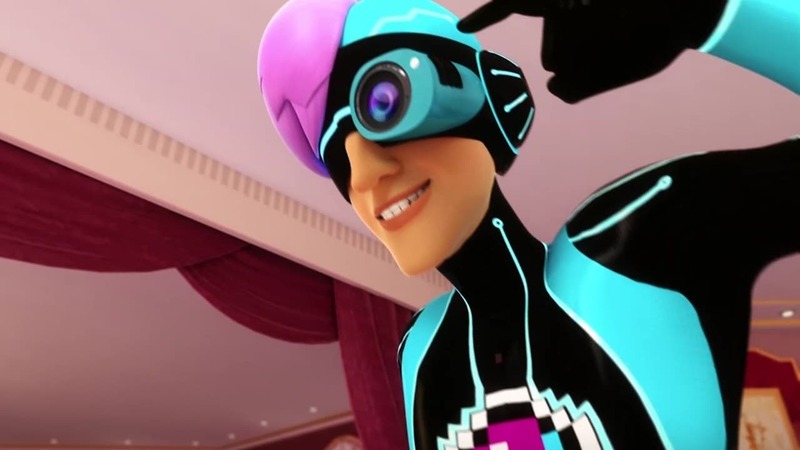 Angry at being shunned by his idol, Vincent becomes influenced by Hawk Moth and turns into Numéric, a supervillain who uses a head-mounted telescopic camera to take photos of people, making them vanish and trapping them in a white empty space by "digitising" them into living portraits that appear on his apartment wall. Distribuie sau scrie parerea ta despre episodul Miraculous: Tales of Ladybug & Cat Noir S01E20 - Pixelator.